There is nothing worse than the unexpected death of a young person at a high school. During my 33 years in education I coped with students who had died in car accidents, students who had been murdered and students who had committed suicide. I had just finished reading this book prior to the inaugural meeting of Writers as Readers. As a retired high school educator, I found this book to be a compelling read and wanted to talk about it with others who had read it. 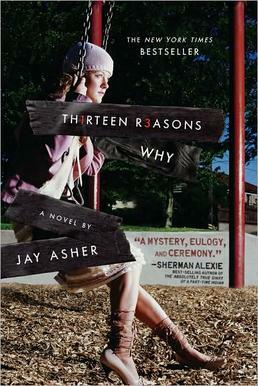 Thirteen Reasons Why is a Young Adult book by Jay Asher, which explains the rationale behind Hannah’s choices, a high school student who has decided to end her life. Clay, a fellow classmate of Hannah’s, has received a box with 7 cassette tapes that Hannah taped before she died. On the tapes are the explanations for her decision. Clay listens to the tapes as he follows Hannah’s words through his home town and what he discovers changes his life. I think that this book can save lives. Writers as Readers, WaR, met on March 4 at the Barnes and Noble at Cherry Vale Mall to discuss this debut novel by Jay Asher. This was the first Young Adult book chosen to be discussed and a range of opinions regarding the characters, plot, and the dual narrative were discussed. Jay Asher wrote Hannah’s story first and then went back and wrote Clay’s reactions as he listened to the tapes. Most of us found this to be a very compelling way to tell the story although it could get confusing at times. Using an audible reader for this book might be an easier way to follow the story. The voice of the protagonist was questioned during our discussion. Many felt that she did not have a legitimate voice and that Hannah’s character was superficial. Descriptions of her clothes and her previous experiences were lacking. We did not ‘get’ who Hannah really was. One point brought up was that a male author may not have been able to authenticate the female perspective. Not a lot of empathy for Hannah was a resounding theme (as a character). Our group is not heartless, we know that there are many young people like Hannah who we do have compassion for. The other major player in this novel was Clay. Clay’s impression of Hannah was disconnected with how she saw herself. We did experience what Clay was going through as he listened to the tapes; the writing pulled us in to the story. A recommendation was that Clay should have done something more negative to her so we could have had a better rapport with Hannah. Several of the secondary characters were not fully developed. Numerous members felt that stereotypes of adolescent behavior were used. Several movie references were noted that had similar players, “Mean Girls” and “The Breakfast Club” to mention a few. Although, another member of the group is an educator and we both found the behavior of the people who influenced Hannah’s decision to ring true and we saw this exhibited in our schools. As our discussion ensued, other books were recommended, The Story of a Girl by Sara Zarr and The God of Animals by Aryn Kyle. Readers who suggested these choices felt they had characters that were more perspicacious. Another perspective we addressed was the fact that we are adult readers and that this might have influenced our views. The book had a very teen age point of view. We reminisced about books we read as adolescents and how a young person would interpret this book. Suicide is such an important topic to address and young people need to understand the consequences of their actions. The author’s didactic approach of this novel was successful. Hannah says, “No one knows for certain how much impact they have on the lives of other people. Oftentimes, we have no clue. Yet we push it just the same”. A cautionary note was that if this book was required reading it should include debriefing for the adolescent audience. The author stated that he listened to music before he writes to inspire a mood. Several of the members of this group also use this approach. This writer has to have it quiet. I really enjoyed our examination of this book. I am learning so much from each member and my writing is being inspired. It has been a very reflective experience. Overall, everyone agreed that they were glad they read the book. For those fans of books being made in to movies, Selena Gomez is the actress selected for the role of Hannah. Production dates have yet to be announced. Jay Asher has co-written a book with Carolyn Mackler, The Future of Us, which deals with young people and the influence that Facebook has on their destiny. Several said they thought that book sounded intriguing. Our next meeting is on April 1 at Barnes and Noble at Cherry Vale Mall starting at 6:30. We will be reading Jacquelyn Mitchard’s book, The Deep End of the Ocean.